I saw this last week when doing some lean assessment work with a hospital Operating Room and support services. One of the main support services is the department that cleans and sterilizes instruments for the Operating Rooms. As part of the sterilization process, they use some visual management and error proofing indicators (multiple levels of this, actually) to make sure that instruments are sterilized before being taken to the OR. One method is the use of a special 3M tape. 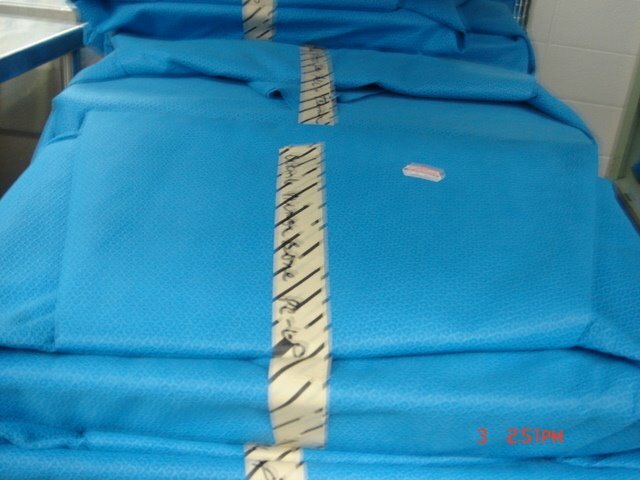 They wrap the instruments and instrument packs in blue paper, a special paper that allows the instruments to be sterilzed using high temperatures and steam. The techs wrap the paper packs with that special tape. 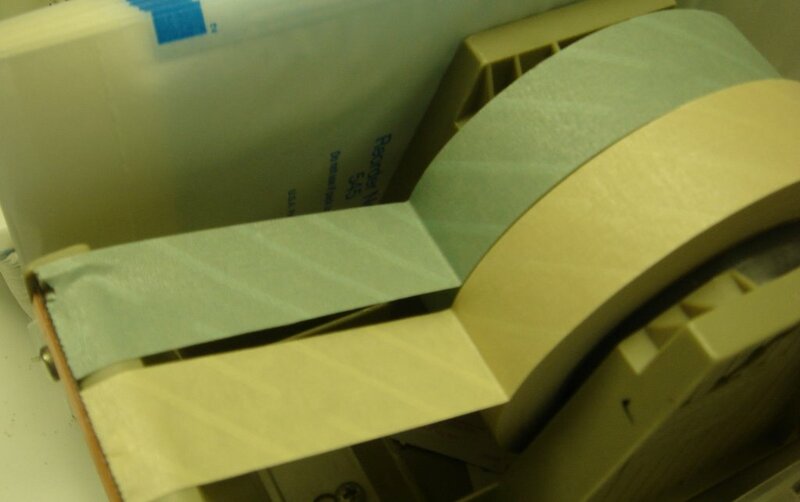 Before sterilization, it looks like normal masking tape (photo to the left). You might be able to see the faint lines on the tape in the above pre-sterilization photo. Once the pack has gone through the sterilizer, the lines change to black (the photo at the left). This is a great use of visual management. If someone thought about grabbing a pack of instruments off of the wrong shelf, the visual signal tells them that the pack hasn't been sterilized. It's possible that a person who wasn't trained well and would try to take instruments off of the wrong shelf wouldn't know about the error proofing, but the nurses who prep the OR's do and would never allow instruments into the OR without that black striping indicating the sterilization. You might be asking about the handwriting. Yes, the write, by hand, on the tape what is inside the blue packs. That's a different issue altogether and another potential risk of error, someone not being able to read that writing. Or, it's a source of waste, if someone is going to spend more time than necessary to find a particular pack of instruments. As with factory inventory, you can put a better process in place or invest in expensive tracking technology. I know my preferred approach — the lean route (better process). I don’t know how good a practice it is, but on one of the real-life emergency room TV shows, an ER doc wrote what he wanted the patient to get (MRI, X-ray, I don’t know) on the sheet next to the patient’s head, in addition to verbal instructions. When I had minor surgery last month, I took magic marker, circled the lipoma the Dr. was supposed to remove, drew a big arrow on my chest to the point, wrote “remove lipoma” next to the arrow, and did about the same on the hand I thought the IV would go in. I’d do it on both hands next time. No one said anything, and maybe they had a good laugh, but I didn’t want to come out of there with the wrong thing cut out.